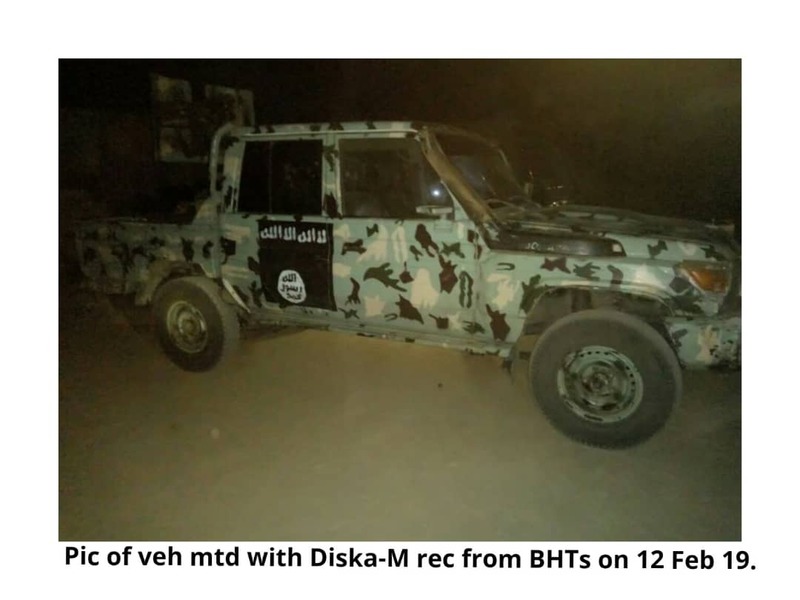 Following the successful neutralising of scores of the Boko Haram Terrorists (BHTs) and recovery of cache of assorted arms and ammunition by the dogged troops of 143 Battalion(Bn), 28 Task Force Brigade, Sector 1 Operation Lafiya Dole recently at Madagali Adamawa State, the battalion has recorded yet another great feat. In this regard, the gallant troops once again devastated and clipped the wings of the terrorists group in a fierce encounter which occurred at about 1810hrs on Tuesday, 12 February 2019. The terrorists came in 5 Gun Trucks, Armoured Personnel Carrier (APC) and Vehicle - Borne IED but met superior fire power by own troops. During the encounter, the troops successfully repelled the attack and went on hot pursuit with heavy fire and momentum. 5 BHTs were neutralised, others withdrew with gunshot wounds while several equipment were captured and others destroyed. Troops captured 1 gun truck mounted with Anti Aircraft (AA) Gun, 1 Rocket Propelled Grenade (RPG) tube, 8 AK 47 Rifles and 60 rounds of 12.77 mm ammunition. Others include 4 X 36 Hand Grenades, 6 AK 47 Rifle Magazines, 1 FN Rifle and 1 Techno Phone. Also, 1 Gun Truck, 1 AA Gun, 1 Vehicle - Borne IED belonging to the BHTs were all destroyed. However, 1 soldier was wounded in action and receiving prompt medical attention while, regrettably a Civilian JTF was killed in action. Further exploitation of initial success was conducted at the early hours of Wednesday, 13 February 2019. Troops discovered 6 additional neutralised bodies of the BHTs and recovered 4 AK47 Rifles, 1 FN Rifle and empty magazine, 1 x 36 Hand Grenade and 1 Unexploded Ordnance RPG Bomb. The Acting General Officer Commanding (GOC) 7 Division Nigerian Army and Commander Sector 1, Operation Lafiya Dole, Brigadier General Abdulmalik Bulama Biu while applauding their effort, conveyed the Chief of Army Staff (COAS), Lieutenant General Tukur Yusuf Buratai's special commendation for a job well done and urged them to maintain the momentum until the total defeat of the BHTs. The COAS also promises to continue to accord greater attention to the welfare of troops and also commiserates with the family of the fallen Civilian JTF.